In honor of the 600-year anniversary of King Sejong’s enthronement and the 572nd anniversary of Hangeul Day, the city of Seoul will host an event from October 6 to 14 that will shine a light on the changes that the influence and value of the Korean language has brought upon Seoul and its citizens. The event will begin on October 6th with a proclamation ceremony for Hangeul week at Seoul Citizens Hall. This exhibit will comprise three themes: various cases of communal languages that were improved in Seoul, cultural property signs that were revised to help citizens better understand, and the linguistic differences between the two Koreas as a stepping stone towards a mature inter-Korean exchange. The exhibit will prove significant in that it is the result of cooperation between the National Institute of Korean Language and Korean language groups. On October 9, Hangeul Day, a citizen flower offering event for King Sejong the Great (Gwanghwamun Square) and a surprise flash mob celebrating Hangeul Day will take place around Hongdae and Seoullo 7017. 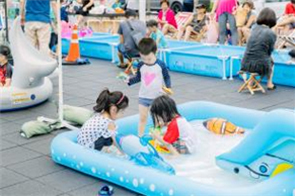 The “Hangeul Playground” that is scheduled to open at Seoul Citizens Hall will offer Hangeul curling for the whole family to enjoy on the holiday, together with many other experiential activities for citizens.